Unfortunately, a video isn’t currently available. Just in case you forgot, the Olympic Test Event is currently running in Rio, the whole world is watching it, so sorry to say it directly, but nobody really cares about the US NCAA (except maybe some US fans) ! Yes because it’s impossible for gymcastic to cover more than one meet at a time! Go eat a bag of dicks. Go eat a bag of dicks…the new Gymcastic Tshirt! Please make this happen Jessica!! Chill out. 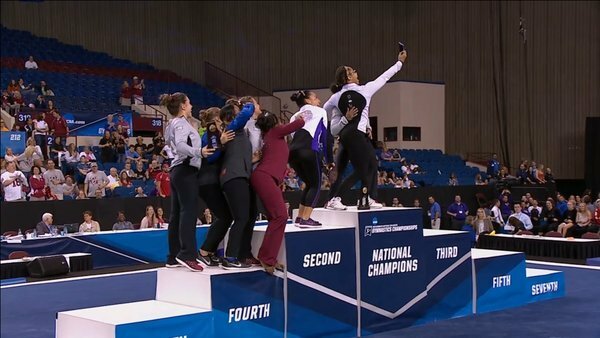 gymcastic can cover more than one meet at a time. Gymcastic, take note, if Greg doesn\’t care about it you should NOT be covering it, regardless of whether you are covering the things Greg does care about such as the Test Event (which you have been covering on the podcast and keeping up with on Twitter). I\’m not sure why you didn\’t realize you needed to consult Greg before posting an article about a major gymnastics event, but let this be a lesson to you. On a totally superficial note I am loving Nina Mgee’s sparkle headband. NEW TREND SPOTTED. Lol there are plenty of people who care about NCAA…Clearly you’re not on Twitter! Ashleigh Gnat did a double twisting yerchenko and got 2nd at semifinals and Katie Bailey did just a half and won vault national champion. I think that was what everyone was afraid of when the half was overlooked in the code. I sure hope that grievous error is corrected for next year. Seems quite unfair to Ashleigh who is going for the much harder vault.